You are here: Home / Tours and Live Performances / 2016 The Original High / Adam Lambert – Diva in Estonia! We’ve seen what happens when Adam Lambert is performing and something in the crowd disturbs him. Remember back in New York, early 2010, even before his first full concert at Fantasy Springs, when someone was talking on their phone during his acoustic set? See below for the video. Here’s the new and improved version! At his Tallinn, Estonia show two nights ago, Adam was singing Trespassing/Another One Bites the Dust and enough was enough from three ladies videotaping him from the front row. He stopped singing and called the trio out, while the music continued to play. Adam’s usual sense of humor was very much present but it was obvious how annoyed he was. I don’t know if these three had done anything else that bothered him besides the taping. He identified them as repeat attendees who travel the world to see him, purchasing the highest cost ticket for front row access. He even chastized them for taking those seats from the locals. I wonder if they’ve had several Meet and Greets too? Watch the video, and at 2:25 the show begins. We’ll chat after the video! What do you think? Could you believe how long it went on for? I know I’d be mortified if that was me! I’d have melted underneath the seat and I’d still be there. I’m not saying I wouldn’t shoot anything. If you’ve got a great seat, how could you not shoot a little? But we’ve learned that more fantastic videos will be on YouTube within hours of the show and he’s absolutely right about not enjoying the show because you’re distracted with the camera and not watching videos later, so it becomes a lose-lose situation. These ladies obviously didn’t get the message or just didn’t care. He even orchestrated the “hands up, put your phones in your pocket” tactic and still it didn’t work. And then we get a rap about it! If Adam’s rapping, you know how out of sorts he is! Do you think maybe they sell the videos or pictures? I’ve heard comments from Adam in the past, stating how surprised he is that fans come to see him over and over and over. And that they wait in line for hours. He’s said he’s never done that (before he was famous) and can’t imagine doing it for anyone. He obviously doesn’t get himself the way we do! Personal note: Lila and I were at the Las Vegas show on April 1, with regular GA tickets. When we got in line in the early afternoon, we were surprised to see several VIP ticketholders already sitting in a different line! We were #6 in line for regular GA, going in after the 329 VIPers. And we ended up right next to them! I only had a vague idea of where Estonia is, mostly from watching Groucho Marx movies. The world map has changed so many times since I left school. It’s in Eastern Europe, on the Baltic Sea, northeast of Poland, just south of Finland, bordering the northwest corner of Russia. See it here. As promised, here’s the first incident from 2010. I love this guy and nothing will change that. But can you say Diva?! Judging from all the furor over Adam’s very honest upset at these women, fans expect him to be perfect at all times. I admit that he is larger than life to Glamberts but personally I’m glad to see him display very normal reactions. I think that very often fans forget that he is actually a human being with human emotions. I think he was really cute and entertaining about it and I applaud him for speaking up. I am dying to know who these 3 ladies are. 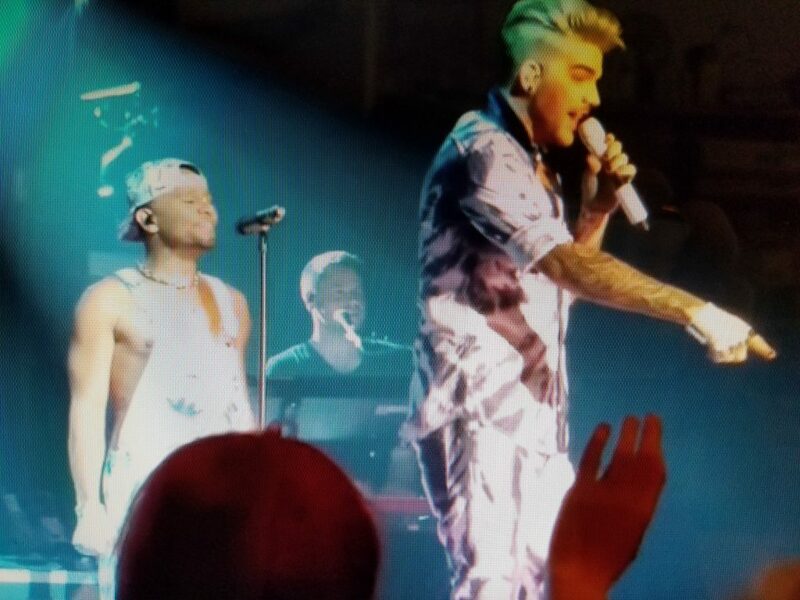 I confess, if I were a lottery winner, it would be fun to see the world while enjoying Adam Lambert concerts! I was wondering the same thing. I can’t imagine how mortifying it would be though. Ouch! Saw Adam in Milwaukee and he actually took a phone out of a fans hand and after having it for a few minutes he threw it down on the stage. I couldn’t tell what he was doing with it while he had it. I wasn’t close enough to see. I do not think Adam realizes how obsessed some of his fans are with him. I was also guilty of taking a few pics with my phone. Thankfully my daughter and son in law were also there and they took some good pics, as I am not very good at it. That was my second concert. Saw him with Queen in Chicago. i was in Milwaukee also , and close enough to see Adam take a selfie and give the phone back to the owner ! Very nice of him. And I’ve been to several of his concerts, and concerts with Queen, and close enough to not only see him, but to have someones phone blocking my view. O.K. for a picture or two, but during the whole concert, how rude !!! I was also at the show in Vegas and had purchased the VIP ticket -without the meet n’ greet- and ended up near the front of the stage behind the rope that sectioned off the area reserved for the meet n’ greet people. Just before the show started, the rope was taken down & we all moved forward, but I still had two ladies in front of me. It turned out to be my lucky day because these two ladies were not impressed with the crowd singing along so they left and I took that opportunity to grab that prime spot! Lucky me! Adam made eye contact with me and it was like a bolt of electricity going through my body. A night I will never forget. Saw Adam in Milwaukee and he actually took a phone out of a fans hand and threw it down on the stage. I do not think Adam realizes how obsessed some of his fans are with him. like I said before, I don’t know what you saw, but I was at the same concert, he took the phone from the fan and took a selfie !! and gave it back to her ! What a gentalman and treat for the fan !!! This issue has been an ongoing one for several years now. The same people over and over again getting the front row seats and feeling entitled to do just that. I admit that I would, ONCE IN MY LIFETIME love be able to get a front row seat to one of Adam’s concerts. I’m never fast enough on the pre sale ticket days and I haven’t figured out how to make that happen. But I would only want to be there ONCE-and then let others have a chance to see Adam up close. I would be beyond embarrassed if Adam was able to recognize me—and started pointing me out in the middle of his performance!!!! Sure, I’d love to be able to travel the world to see Adam —and take in all the different cultures -but I would NOT be up front , keeping others from having their chance to experience this incredible young man! I’m embarrassed for those ladies—That’s all I have to say about it. Thank you so much! It was a lot of fun and we love organizing fan meet-ups like this. We’ll for sure do it again one day! How do they afford to travel to his concerts over & over? I wish I had a fraction of their money. I live on a disability pension and I would love to travel to some of Adam’s shows in the USA but I doubt it will ever happen. I managed to see Adam when he came to my city with Queen. It was one of the highlights of my life. I enjoyed every minute of it and I sure wasn’t on my phone because I can’t afford one that will record for very long! Frankly , if I had the money , I’d get front row tickets at every concert ! Would I vidieo tape , not a chance ! I have been able to get some pretty good seats , only to have some idiot hold their camera up , blocking my view ! Adam is so adorable as usual and honest. I saw him in the states 3 times on his 1st tour and it was wonderful. I am hoping to see him again someday. He is the greatest. I wish someone would put him in a movie. I loved him on Glee. Dare I say this? I think Adam was out of line to complain about fans’ behavior as long as there are no rules about filming or sitting on the front row. Know about these fanatical fans who follow him all over with enough money and time to secure great seats and M&Gs. Good for them, and they should not be publicly ridiculed for being a mega fan. And Adam should be thankful they are there and not publicly proclaim they should make room for others. If he or his managers think he’s gotten so big that there’s no more M&Gs but “photo opportunities,” and folks want to pay $500 for that honor, that’s their business. I’ve been a fan since the beginning (audition) and been to lots of concerts because I like his music. No, I don’t sit on front row, but I’ve always had good seats. What a shame that people are called out for wanting to be close…does he think those seats are free? Honestly, I’m disappointed in his behavior. Just stay professional and do your show and be happy you have dedicated fans. And if you don’t want videos (fine with me), make it a rule for everyone, not just front row. Some of the rest of us would like to see also w/o a stinken cell phone in their view. Video recording with mobile phones is irritating for everyone. I saw this happening during the Hammersmith Apollo London concert. One bloke taped the entire show. Even the warm up act. All these arms up in the air with lit up phones attached!!! Very annoying. I’d also like to mention that two rows down from us were four women who seemed to think they were the only four people at the concert. They stood up dancing for over three quarters of the concert obscuring the view of everyone behind in subsequent rows. A gentleman kindly requested they sit down but they refused. A scuffle broke out and so much arguing. They ruined the show for so many people who basically ended up paying a lot of money to hear the best singer in the world whilst watching four backsides. Now i understand their enthusiasm. But to upset so many people was bad. Very unfair. Please think of how you are behaving when at concerts or cinema. Don’t be selfish. End of rant. Are you saying that people were sitting down during a rock concert and were upset people were standing and dancing in front of them? My daughter and I attended the Atlantic city concert. My daughter slipped up front to take a photo and Adam took the cell phone and started taking pictures of her! He got a pretty cool panoramic shot of her throwing kisses at him. (quite the multi-tasker- never missed a beat). In our case, we took it as an amazing fun gesture and I will keep the phone forever (since it was mine she was using! And yes, others got a video of the moment! Check it out it was during the same song. Wow, that’s a fantastic story! What a great memory! casino in Oklahoma. It was one of the best concerts that I had ever been to. I have liked him ever since American Idol. If I could afford it I would travel the world to see him and it would really annoy me with someone’s phone in my view.